THE NEW 6.4 SERIES. CLASS-BEATING TECHNOLOGY NOW AVAILABLE IN 4 CYLINDER GUISE. 4 CYLINDER ENGINES, 3 CHOICES OF TRANSMISSION AND COUNTLESS POSSIBILITIES FOR CONFIGURATION. A 4 cylinder tractor is the best solution for a wide variety of agricultural applications. With this mind, the 6 Series family now includes three 4 cylinder models with power outputs from 156 HP (114.7 kW) to 171 HP (125.8 kW): 6155.4, 6165.4 as a top model 6175.4. All are now featuring higher permissible weights (11,500 kg) and a longer wheelbase (2,543 mm) which guarantees a quiet and comfortable driving performance. 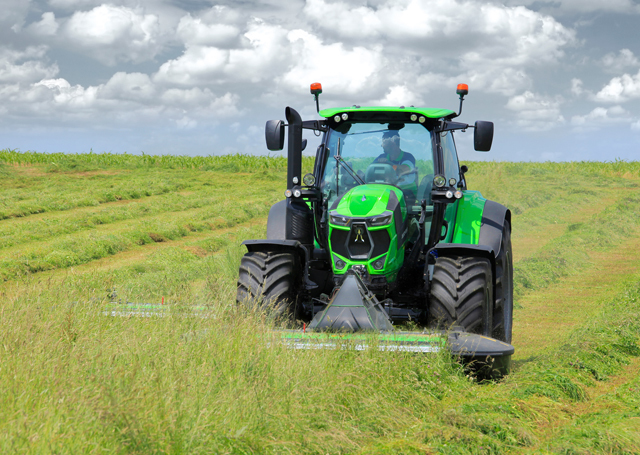 The design of the 4-cylinder models has the family feeling of the 6-cylinder versions which were awarded “Tractor of the year for the design” already last year.From tilling, sowing, cultivating and transport usage to forage harvesting and working with a front loader: these tractors can be tailored to cater for any specific need. 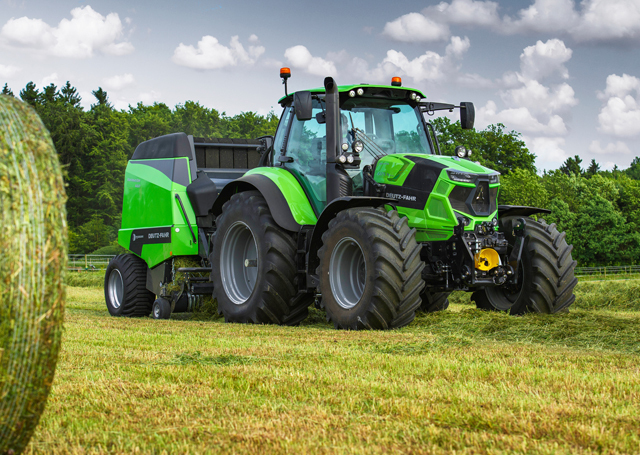 The same is true when it comes to the choice of equipment and variants offered, with the DEUTZ-FAHR 6 Series available with three transmission versions, a variety of wheelbases and endless scope for configuring the ideally equipped tractor for your needs. 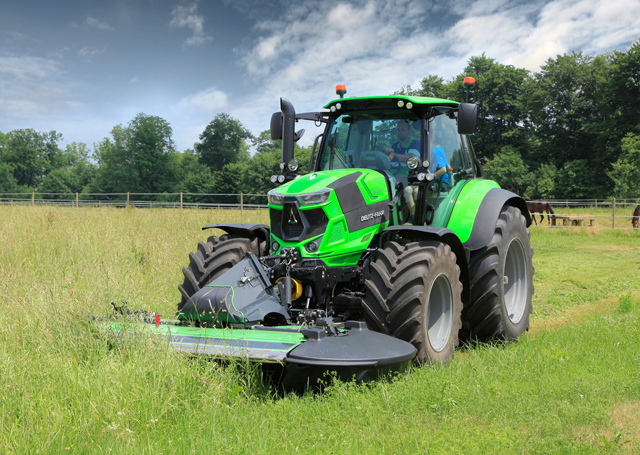 With the 6 Series, DEUTZ-FAHR offers an all-new range of equipment and comfort features, and has introduced three additional options for the new 4 cylinder models. The compact new 4 cylinder engines of the 6 Series feature all-new exhaust management technology resulting in improved response, improved torque reserve and improved pulling away power, with more torque on tap at lower engine speeds. The new exhaust systems of these engines use EGR and SCR exhaust after-treatment technology and are equipped with an additional passive DPF (diesel particulate filter). The DPF filter offers three significant advantages over conventional active filters: no fuel injection into the filter is required, less heat is produced around the unit and the filter itself regenerates more quickly. This saves fuel and money while ensuring compliance with both current and future international emission standards. On TTV models, engine efficiency is improved even further by the electronically controlled Visco fan. 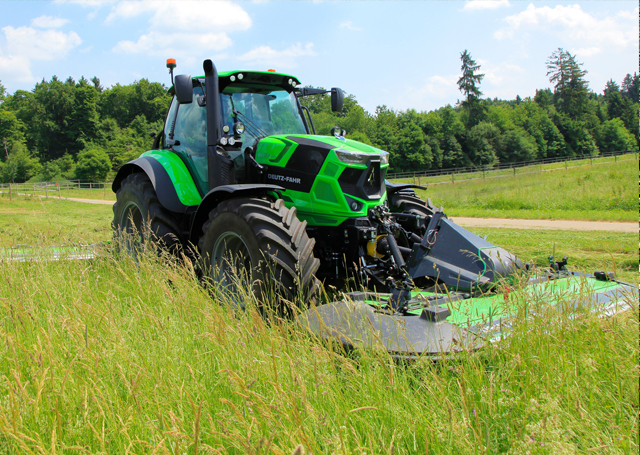 The new DEUTZ-FAHR engines are a paragon of state of the art German technology, and offer unparalleled reliability and efficiency for outstanding results. POWERSHIFT, RCSHIFT OR TTV: THE CHOICE OF TRANSMISSION TYPE IS YOURS. 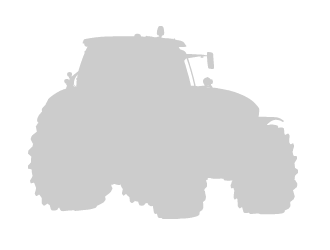 What is the main area of focus for your tractor? Simple farmyard work, grassland work, heavy transporting, pulling heavy implements in the field or a mixture of all of these? Whatever the focus of your new 6 Series, it offers exactly the right transmission for any driver demand and any budget. With 5 mechanical gear speeds plus 6 Powershift steps forward and 3 reverse, the Powershift transmission offers 30 + 15 (with creeper: 54 + 27) total number of speeds for 40 or 50 Km/h maximum speed (according to the markets regulation) at reduced engine speeds. Fully automatic RCshift transmission offers, 5 robotised speeds gear plus 6 Powershift steps forward and 3 reverse, for a total number of speeds of 30 + 15 (with creeper: 54 + 27). A high speed and high pulling transmission. Maximum comfort and high efficiency: it's the TTV transmission. This efficient and reliable system is capable of varying speed continuously, optimising engine power without unnecessary loading or fuel wastage, for easier and more productive work. These operating principles allow the TTV transmission to quickly provide the required driving speed, ensuring a smooth drive and advantages in terms of on-the-move comfort and safety, particularly when driving on roads. All transmissions are easy to operate, simple to programme and easy to monitor via the on board displays. They each offer excellent efficiency, precision and effectiveness .Manual, fully automatic or CVT: when it comes to driving comfort, the choice is yours. BEST PROSPECTS FOR YOUR WORK. PREPARED FOR A WIDE RANGE OF APPLICATIONS. The attachment points of the new models are available with a wide range of feature options. For the hydraulics, you can choose between mechanical and electro-hydraulic controls, up to five hydraulic valves in the rear and two in the front, and a hydraulic pump output of up to 170 L/min, with a rear lifting capacity up to 9.700 kg. The models with the MaxiVision 2 cab have all the hydraulic inputs proportionally controlled, for a broader control of implements. A separate oil tank ensures an ample oil supply for the TTV models. The main hydraulics are offered with a Load sensing system or an open centre constant flow pump. The new front linkage system of the 6 Series TTV range is equipped with a position control function, providing greater control across a broader range of implements. The new front support with new integrated front lift is designed to match the front suspension. This solution combines a compact structure, for larger steering angles, with a lifting capacity of up to 5480 Kg, and may be equipped with up to two front distributors. The front hitching zone may also be equipped with an integrated ISOBUS terminal. The new front axle and the braking system of the 6 Series are unique in this performance class. The front axle now features an adaptive suspension system with automatically controlled suspension height and a swing arm with increased arm excursion, significantly increasing the driving comfort. Depending on the brake intensity and driving speed, two suspension levels are activated – the AntiDive and AntiRise system, or the complete suspension system in the field and on the road; the suspension system can also be locked. The additional Booster brake system ensures maximum braking performance with the lightest pedal pressure. TTV models are equipped with the EPB: the automatic parking brake system which acts on the rear brake discs. The EPB automatically disengages when the shuttle direction is activated and automatically engages when the driver leaves the seat. Moreover, TTV models can be equipped with the new exhaust engine brake, for 40 % more braking power, especially when driving downhill with heavy loads, this system prevents the service brakes from overheating. This increases safety and decreases service costs. The operation is comfortable, easy-to-use and reliable via an additional pedal that is controlling a butterfly valve. The braking performance is optimised automatically according to the pre-selected driving mode (Auto, Manual, PTO). COUNTLESS CABIN COMFORT OPTIONS: THE CHOICE IS YOURS. In general, the higher the driving and operating comfort, the more productive the work. And the more relaxed the work, the better the results. For this reason, all 6 Series models offer first class cabin comfort. Unique in the market: You can choose from a multitude of technology, equipment, specification and comfort variants. It's completely up to you. Based on the intended purpose of the tractor, on the driver's demands - there is a solution for all budgets. Whatever the requirements, the new 6 Series has you on the right track. A choice of cabins is offered with different comfort features depending on the specifications of the tractor itself; from simple manual mechanical controls to multifunction electronic joysticks. You can choose between three escape hatch options – a simple green sliding roof, a glass roof with UV absorption or the FOPS safety version for optimal views while using the front loader. Whatever you choose, the new 6 Series will meet your personal demands. SUPERB IN-CAB COMFORT. EVERYTHING YOU NEED TO WORK WITH COMPLETE PEACE OF MIND . The unique features offered by MaxiVision and MaxiVision 2 can be seen from both inside and outside the cab. When it comes to ease of use and ergonomics, the new 6 Series caters for the operator by making best use of the technology available. The InfoCentrePro on the dashboard features a 5" colour display, providing the driver with a stream of data about the tractor's operating conditions. 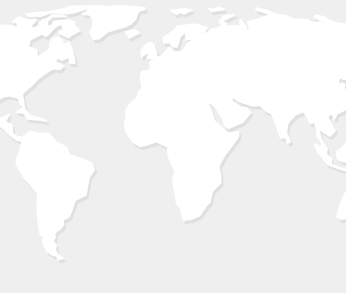 It offers maximum convenience in terms of settings and information. On TTV models there is an additional WorkDisplay fitted on the right pillar, performing real time working information. The interior provides a peaceful working environment with all engine noise, vibrations and heat reduced to a minimum as there is no connection between the cab and engine. The best possible view of rear attachments is guaranteed by the rearward position of the cab.4th Gen LED lights are available as option to enhance the visibility during night works. Other features maximising driver comfort include the generously sized windows and windscreen and the new door closure system. The air conditioning system – with automatic functions – optimises the internal temperature, while the largest number of air outlet openings In this tractor class guarantee uniform air distribution like no other model. With the MaxiVision and MaxiVision 2 cabs, you can look forward to extremely comfortable and efficient work. All models can be equipped with an Agrosky antenna and are thus ready for precision farming.